Thousands of District employees who use Metro, fleet vehicles, personal cars, Taxicabs, Uber, and other methods to get around the city now have another option. 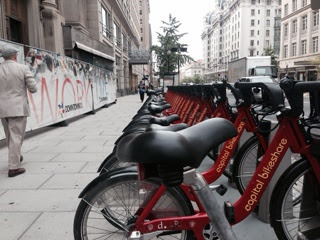 According to the the District Department of Human Resources, District government employees may purchase Capital Bikeshare memberships for an annual fee of $25, a savings of $60 off of the standard membership rate of $85. The program will begin Monday, May 16, with emails sent to employees that will contain the program password and registration instructions. For employees who are already members, they can renew their individual memberships up to two months in advance at the employee rate. The program also provides helmets for an additional $16. The District would be one of a few cities that provide this type of benefit to its employees. Earlier this year, California instituted its own employee bike sharing program to help its Department of Transportation (Caltrans) employees travel to meetings where a vehicle might otherwise be used. Smaller cities like Burlington, Vermont, through its City Green program, have a bike sharing amenity. With thousands of bikes in the Capital BikeShare fleet combined with the thousands of government workers, this may be the largest program of its type in the country.